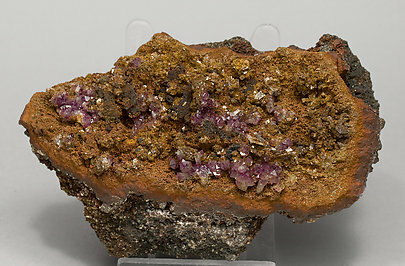 Very gemmy and very brilliant, the combination of the colors of the manganoan Adamite and the regular Adamite make an extremely attractive display specimen. Between orange and reddish this manganoan Adamite shows an unusual agreeably color. Great luster as well. 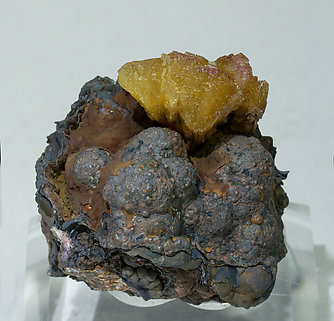 A mushroom-like growth on a botryoidal Goethite matrix of Adamite crystals with very well defined faces and edges, a deep yellow color and violet shades on terminal faces. An excellent “oldie” from Mapimí. 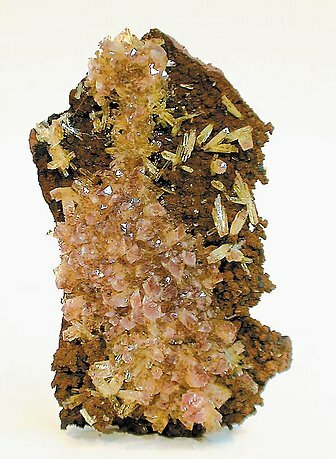 The crystals are more isolated than usual for samples from Mapimí. 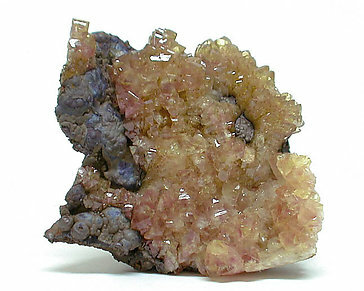 They are on limonite matrix and have a very intense color and luster (but with a little bit less contrast than in the photo). The sample is with a card from the Folch collection (number 13015) that we'll send to the buyer.